A Feature At IKF New York Showdown 3!!! New York Showdown 3 A Huge SUCCESS! Once again, IKF Promoters Steve Ventura, David Ross and their "New York Showdown" event proved that an all amateur card can provide non-stop action and excitement and draw large crowds of spectators. Once again, the tickets were sold out well before the day of the event, the place was packed with those willing to stand just to see the action and unfortunately many were turned away at the door. Almost all of the trainers in attendance joked that it was time to find a bigger venue! The New York Showdown series has rightfully earned an excellent reputation as a high quality event open to all amatuer fighters, which is fair and which is open to all rules styles. The eleven matches featured Full Contact Rules, International / Leg Kick Rules, Modified MuayThai Rules, San Shou Rules and even a Pancrase style match. The event also featured a wide variety of New York area gyms including NY kung-fu and Kickboxing, Yee's Hung Ga, Ultimate Muay Thai Gym, Borodine's Muay Thai, Moti Horenstein's Survival Center and Jonas Nunez' America's Finest Academy. Alex Alonso (America's Finest) defeated Chris John (NY Kung-Fu) by split decision. This fight was not scheduled to happen but turned into a great fight! First, Chris John was filling in for a sick team mate and took the fight the night before. Then, unexpectedly, the other fighter also dropped out and Alonso stepped into the ring with 10 minutes notice! For two last minute replacements, these guys fought a back and forth, action filled bout which brought the crowd to its feet on several occassions. Lamont Pickney (Ultimate Gym) defeated Ray Cruz (Survival Center) by unanimous decision. Rumor has it Pickney has been training seven days a week with Muay Thai world champion Coban and it showed as he fought brilliantly against a game and tough Cruz on way to this victory. San Shou Rules: Albert Pope (Boston San Shou) defeated Larry Lierman (Yee's Hung Ga) by unanimous decision. Pope's wrestling background proved decisive here as he used many throws to dominate this match. Michael Colon (America's Finest) defeated Norman Lattis (NY Kung-Fu) by unanimous decision. IN this match, Lattis' inexperience did him in. He came out like a ball of fire in the first round, winning it on all three judges' cards. However, he tired himself out and a clever Colon capitalized to win the next two rounds and secure victory. Larry Norman (NY Kung-Fu) defeated Mark Camaj (Ultimate Gym) by split decision. 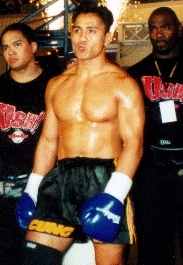 Norman, the smaller of the two fighters but currently also fighting in the Golden Gloves tournament, used his superior boxing to win this bout. With the leg kicks about even, the overhand right and hook proved to be the decisive factor in this bout. Gree Dorsey (Baltimore San Shou) defeated Brian Klingborg (Yee's Hung Ga) by majority decision. A close and very technical match that once again pitted Yee's Hung Ga against Boston San Shou. Adam Resnick (NY Kung-Fu) defeated Hassan Aziz (Aziz Muay Thai) by FORFEIT. Sadly, the only negative in the entire event was the attitude of the head trainer of Aziz Muay Thai. First he complained that the scale was wrong even when BOTH fighters were weighed in at the same time on the same scale! Second, he complained about a three pound weight difference? Third, despite agreeing to an international rules bout A MONTH before the event, he decided on the day of the event that they wanted to fight Modified Muay Thai. Obviously, Aziz was told this could not be done the day of an event! The final straw was refusing to put on their head gear once in the ring. Instead, they turned around and walked out of the ring, refusing to fight! The other Muay Thai gyms in attendance felt that Aziz's conduct gave Muay Thai a bad name, especially as all 200 spectators in attendance booed and hissed! Brad Pearce (Renzo Gracie BJJ) defeated Jimm Zabiegalski (Shuai Jiao) by collar choke from mount. David Whiltshire (Yee's Hung Ga) defeated Ray Neves (Boston San Shou) by TKO at beginning of RD 3. Neves' vision was not clear at the end of RD 2 and so his corner kept him on the stool at the beginning of RD 3. Whiltshire extends his record to 3-0 and is an up and coming local fighter. IKF United States Amateur MuayThai Light Middleweight Champion Steven Berkolayko (Borodine's Muay Thai) defeated Misael Aponte (Ultimate Gym) by unanimous decision. Berkolayko showed a wide variety of technique and a firece fighting spirit in this match, moving constantly forward and throwing many fierce combinations. Aponte was game and strong but simply outmatched this time around. San Shou Rules: Marvin Perry (Boston San Shou) defeated Mohammedreaza Saghei (NY Kung-Fu) by TKO RD 2. Mohammedreaza injured his ankle after receiving a low kick and could not continue.Perry continues to show that he is a clam fighter who sticks to his game plan and continues to improve. Of course, Mohammedreaza wants to return from the injury and fight again! The next New York Showdown will be held June 24, 2000. For fighter info or tickets info, please contact Steve Ventura or David Ross at (212) 242-2453. On April 7th, 8th & 9th, 2000, New York Kung Fu & Kickboxing, will be host to the 2000 IKF / RINGSIDE North East Division #1 Regional which will include the states of New York, New Jersey, Pennsylvania, Delaware, Maryland, West Virginia, Virginia. For more info, see their info page for this event by clicking HERE! Action At IKF New York Showdown 3!!! For more information on this event, contact Mr. David Ross or Mr. Steve Ventura at (212) 242-2453 or e-mail by clicking HERE! Check out this photo at right just moments before his OUTSTANDING PERFORMANCE in Hawaii last year against China's #1 San Shou Fighter.